Matthew Aaron White age 19 of Springfield passed away on January 4, 2018 surround by his loving parents. He was born on May 29, 1998 at Vanderbilt Medical Center. Matthew had a personality that would brighten even the darkest day just by one smile or one laugh. He enjoyed watching Barney and other cartoons, going camping outdoors with his family. Matthews favorite pass time was spending it with his favorite nephew, Oujiah and his loving sisters, Adrianna and Tamara. Matthew is preceded in death by his maternal grandparents, Robert and Nellie Whitaker, paternal grandmother, Rachel Capps; aunts, Cathy Creek and Judy Reeves. He is survived by his loving and devoted parents, Paul and Tammy White; sisters, LuAnn Marie Rose, Adrianna Nicole White and Tamara Lynn White; nephew, Oujiah White; paternal grandfather, Marvin Eugene White; uncle, Tommy and Glenda Whitaker and aunt, Louise Sanders; teachers, Lori Dozier and Tina Magill. A Life Celebration will be held on Friday, January 12, 2018 at 11am in the Chapel of Springfield Funeral Home with Brother Steve Freeman officiating. The family will receive friends on Friday from 10-11am at the funeral home. My thoughts and prayers are with your family during this time of bereavement and the days to come! The Bible says to be absent from the body is to be present with the Lord. 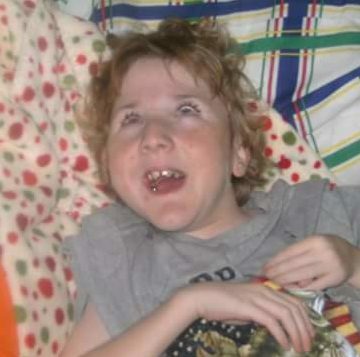 Matthew now has his wings and his smile is brighter than ever. God bless each of you! I heard so much about Matthew. My daughter(Bray Chatman) loved him so much . She talked about him all the time when she was in school. Such a sweet boy. He will be missed. I remember seeing him in Ms.Doziers class room. Yall are in my thoughts and prayers.